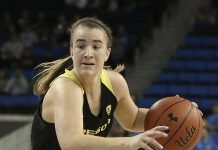 Oregon guard Sabrina Ionescu drives against Erica McCall and Briana Roberson in a Pac-12 Tournament game last weekend. Photo by Michael Houston/T.G.Sportstv1. When the NCAA women’s basketball selection committee reveals the field of 64 teams for the upcoming NCAA tournament in two days, there’s a very good bet that six Pac-12 teams will be taking part. The conference, which is top-rated when it comes to the RPI, should have four teams that receive top four seeds for the second straight season. Oregon State (29-4), which won the Pac-12’s regular-season title for the third straight season, is projected to be a No. 2 seed. 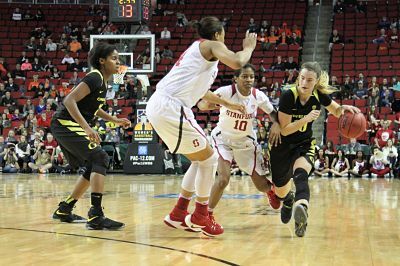 Stanford (28-5), which finished second behind the Beavers but topped Oregon State 48-43 in the conference tournament’s title game last week, is also projected to be a No. 2 seed after that victory. 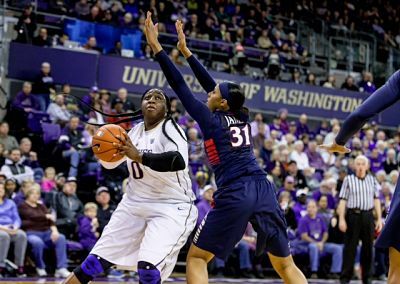 Washington (27-5), which finished tied for second in the conference with Stanford, is projected to be a No. 3 seed. The Huskies lost their quarterfinal game to Oregon in the Pac-12 tournament. 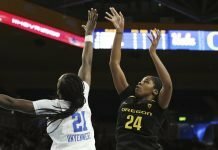 UCLA (23-8), which was fourth in the regular season and lost to Oregon State in the tournament semifinals, should be a No. 4 seed. The top four seeds in each regional will host first- and second-round games. However, Stanford is unable to host this season due to the school hosting the Pac-12 gymnastics championships the same weekend. Oregon advanced to the semifinal game by upsetting the Huskies. They are expected to receive a bid to the NCAA Tournament. But Washington coach Mike Neighbors is confident that his school will be hosts next weekend. Washington’s Chantel Osahor looks to take a shot. Photo by Scott Eklund/Red Box Pictures. Oregon (20-13), which hasn’t been in the NCAA tournament since 2005, is projected as a No. 8 seed after finishing sixth in the conference and playing for the tournament championship. Their win over the Huskies will most likely pushed the Ducks to the Dance despite an 8-10 mark in the conference’s regular season. 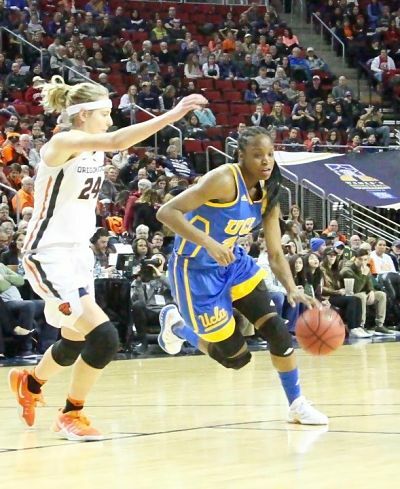 UCLA’s Kennedy Burke takes the ball up court past Oregon State’s Sydney Wiese in the Pac-12 Tournament semifinal game. Photo by Michael Houston/T.G.Sportstv1. Arizona State (19-12), which was a No. 2 seed last year after sharing the regular-season title with Oregon State, finished fifth in 2016-2017 and is projected to be a No. 7 seed. 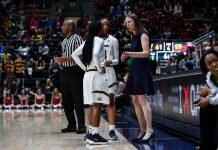 The only other conference team that has a shot at making the tournament is California (19-13), and coach Lindsay Gottlieb made her pitch for the Golden Bears after they lost to Oregon State in the Pac-12 tournament quarterfinals. Stanford coach Tara VanDerveer said the same thing in a conference call prior to the Pac-12 Tournament. While that doesn’t appear to be the case, had Oregon State won the conference tournament, coupled with Baylor’s loss in the Big 12 title game, there could have been a strong discussion for the Beavers to be the No. 1 seed in the Stockton Regional. As for Cal’s issues, according to ESPN bracketology expert Charlie Creme, the fact the Golden Bears were just 6-12 in the regular season is a sticking point. The conference had a terrific run in 2016 with four three teams reaching the Elite Eight – Oregon State, Stanford and Washington – and two advancing to the Final Four – Oregon State and Washington, which defeated Stanford in the process. That could be tough to duplicate this year, but the conference has shown it can compete against some of the top teams in the country the past few seasons. The selection show begins at 4 p.m. Monday on ESPN.